City of Los Angeles officials were at Fire Station 71 recently to highlight and demonstrate how to properly recycle Christmas trees and provide important fire safety tips. 2) Curbside – Those who are unable to cut or place in the green bin, may leave their tree at the curb on their weekly collection day. 3) Drop-off – Use one of 12 Los Angeles Fire Stations to recycle their trees. In addition, residents can go to six Recreation and Park locations on Sunday, January 3, 2016 from 9:00 a.m.-4:00 p.m. Go to www.lacitysan.org or call (800) 773-2489 for locations. 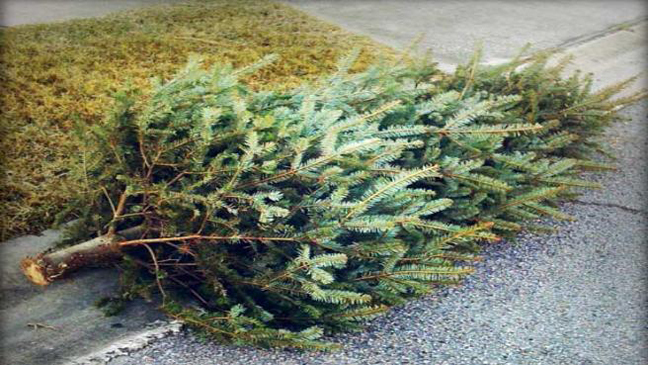 Residents of multifamily buildings are requested to place their Christmas trees at the curbside on the day of collection by LA Sanitation in their neighborhood. For collection day information, go to www.lacitysan.org or call (800) 773-2489. Holiday wrapping paper, cartons, cardboard, Styrofoam® and other expanded polystyrene products, plastics and gift boxes are also recyclable and should be placed in the blue bin. However, it is illegal to place household hazardous waste, such as electronics (i.e. televisions and computers) and batteries into the collection bins. Please take those items to one of seven S.A.F.E. Centers for safe disposal and recycling. Go to www.lacitysan.org for locations and times.